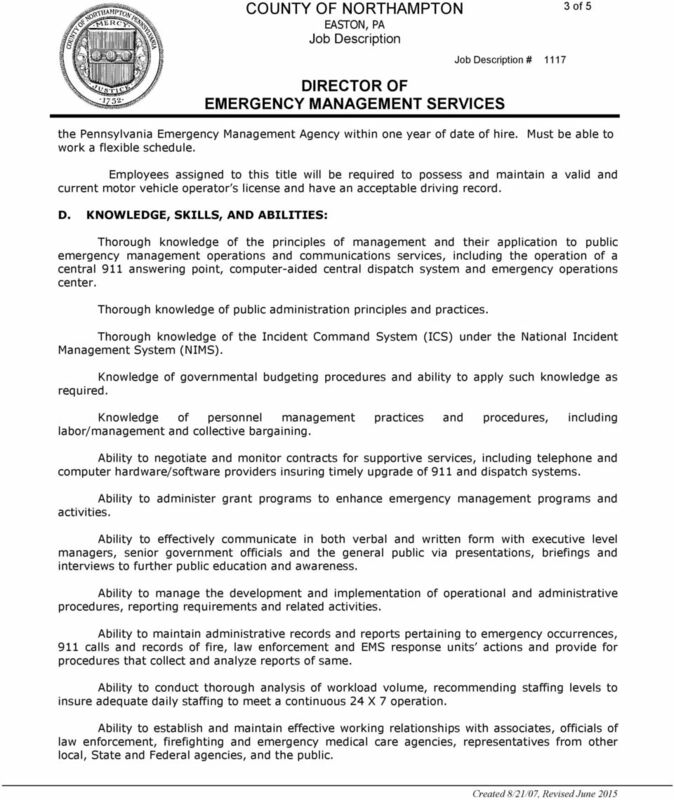 Download "COUNTY OF NORTHAMPTON EASTON, PA Job Description DIRECTOR OF EMERGENCY MANAGEMENT SERVICES"
1 1 of 5 DEFINITION The Director of the Emergency Management Services directs and plans all of the administrative and operational activities of the Emergency Management Services Division. 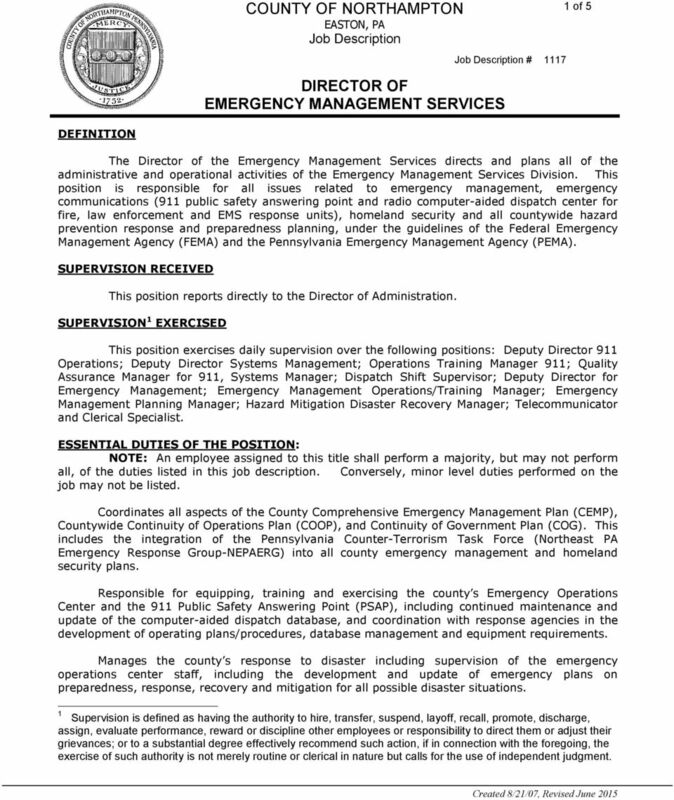 This position is responsible for all issues related to emergency management, emergency communications (911 public safety answering point and radio computer-aided dispatch center for fire, law enforcement and EMS response units), homeland security and all countywide hazard prevention response and preparedness planning, under the guidelines of the Federal Emergency Management Agency (FEMA) and the Pennsylvania Emergency Management Agency (PEMA). SUPERVISION RECEIVED This position reports directly to the Director of Administration. SUPERVISION 1 EXERCISED This position exercises daily supervision over the following positions: Deputy Director 911 Operations; Deputy Director Systems Management; Operations Training Manager 911; Quality Assurance Manager for 911, Systems Manager; Dispatch Shift Supervisor; Deputy Director for Emergency Management; Emergency Management Operations/Training Manager; Emergency Management Planning Manager; Hazard Mitigation Disaster Recovery Manager; Telecommunicator and Clerical Specialist. 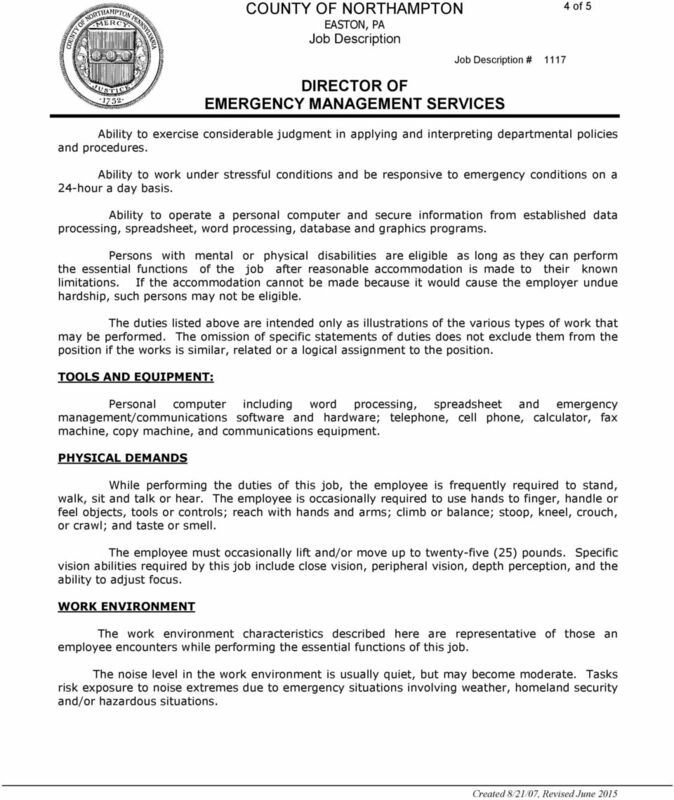 ESSENTIAL DUTIES OF THE POSITION: NOTE: An employee assigned to this title shall perform a majority, but may not perform all, of the duties listed in this job description. Conversely, minor level duties performed on the job may not be listed. 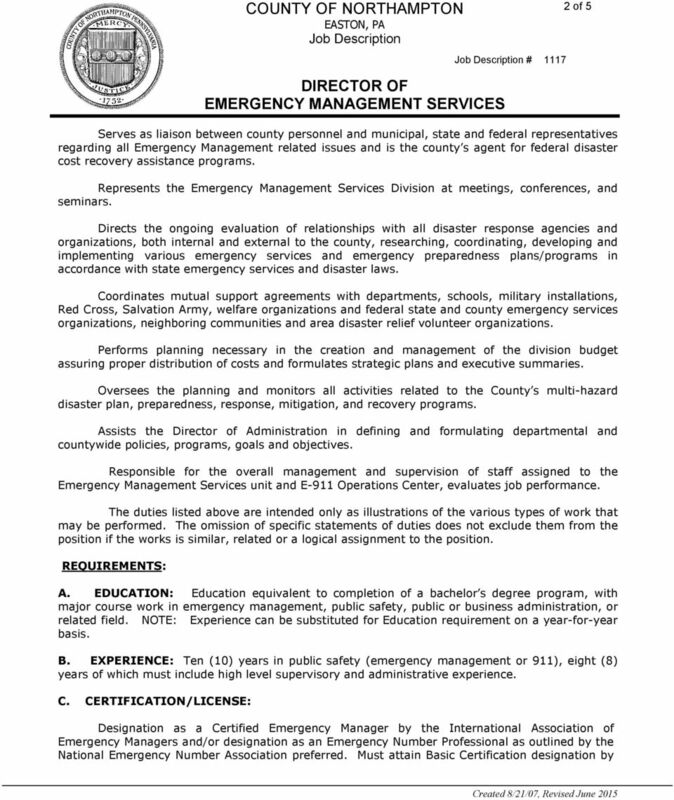 Coordinates all aspects of the County Comprehensive Emergency Management Plan (CEMP), Countywide Continuity of Operations Plan (COOP), and Continuity of Government Plan (COG). This includes the integration of the Pennsylvania Counter-Terrorism Task Force (Northeast PA Emergency Response Group-NEPAERG) into all county emergency management and homeland security plans. Responsible for equipping, training and exercising the county s Emergency Operations Center and the 911 Public Safety Answering Point (PSAP), including continued maintenance and update of the computer-aided dispatch database, and coordination with response agencies in the development of operating plans/procedures, database management and equipment requirements. Manages the county s response to disaster including supervision of the emergency operations center staff, including the development and update of emergency plans on preparedness, response, recovery and mitigation for all possible disaster situations. 1 Supervision is defined as having the authority to hire, transfer, suspend, layoff, recall, promote, discharge, assign, evaluate performance, reward or discipline other employees or responsibility to direct them or adjust their grievances; or to a substantial degree effectively recommend such action, if in connection with the foregoing, the exercise of such authority is not merely routine or clerical in nature but calls for the use of independent judgment. 5 5 of 5 FLSA STATUS: FLSA EXEMPT PAY GRADE: CS-34 UNION STATUS: NON-UNION INCUMBENT S ACKNOWLEDGEMENT: My signature below acknowledges that I have received a copy of my job description and that I understand that it is my responsibility to perform the duties of the position. 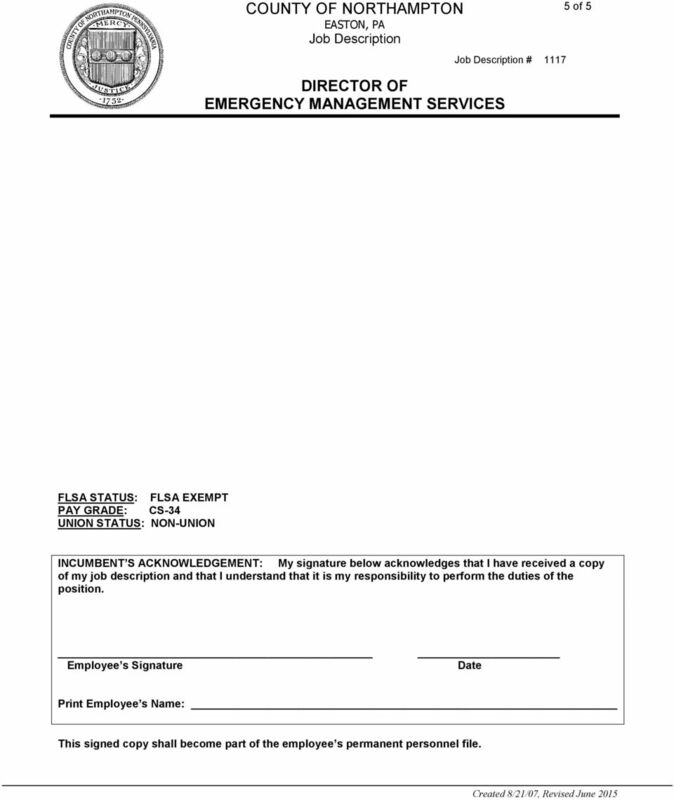 Employee s Signature Date Print Employee s Name: This signed copy shall become part of the employee s permanent personnel file.